Welcome to the 62nd century and the world of Terra Nova. Colonized by humans, left to fend for itself, and divided between two rival superpowers, recent events have brought this formerly united planet once more to the brink of war. The harsh battlefields of Terra Nova are home to a new type of fighting machine: the 15 foot tall war walkers called Heavy Gears. Filling a role between tanks and infantry, it has radically altered the face of warfare. The battle for Terra Nova has begun. Will you fight for honor, for pride, or for the land to call your own? An introduction to the world of Terra Nova. 4-page map section covering all of Terra Nova. A scenario generator that encourages tactical victory conditions, designed to work well with leagues and tournaments, including basic campaign rules. Comprehensive Field Guides for the Northern Guard, Southern MILICIA, Peace River Defense Force, and Port Arthur Korps, along with individual Member League Armies and the Leagueless to support you in building your forces. Regiments of Note listings covering the more interesting and unique regiments on Terra Nova. Timeline covering from before the Interpolar War to the formation of the Westphalia Cabinet and the Black Talons. 90+ datacards, covering all the standard vehicles used in the Field Guides. A core miniature game rulebook for all players; Requires the use of six-sided dice (not included) and Dream Pod 9 miniatures. For two or more players, age 8 and older. 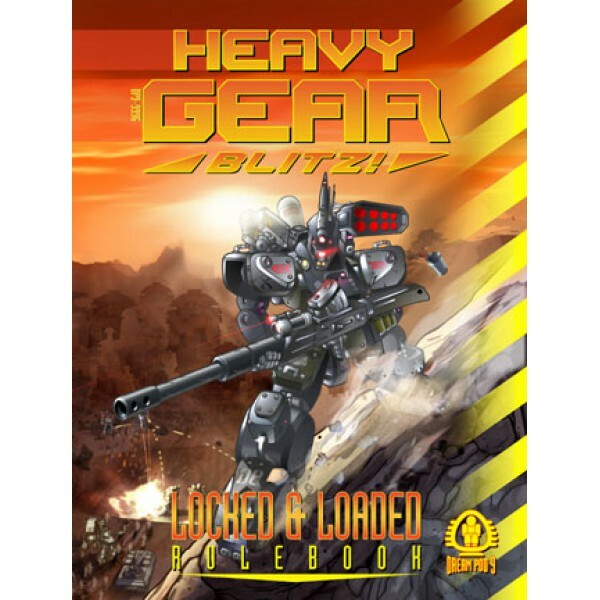 The Heavy Gear Blitz Locked & Loaded Rulebook Revised Edition Rev 1.1 includes some new pictures of miniatures not available when the book was first released. Plus small rules and text revisions along 1 new page of datacards and 3 pages of quick reference sheets at the end, that bring the interior page count up to 204 pages.